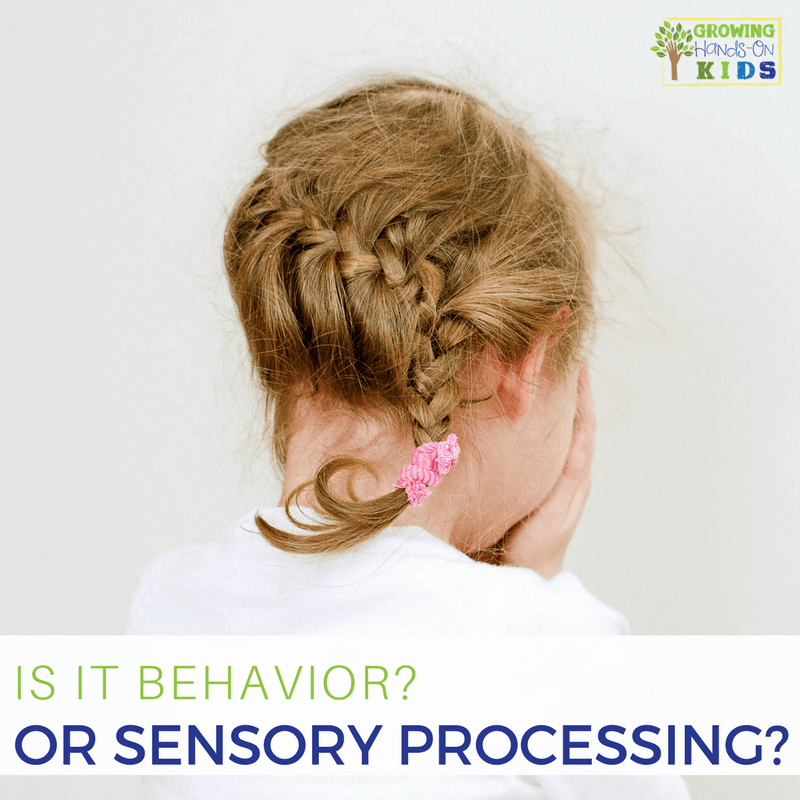 If you've been looking into sensory processing activities for your child or student, you have most likely come across the term “heavy work”. What exactly is heavy work and how it is beneficial? We'll answer these questions today as well as give you some heavy work activities for kids. Heavy work is a term coined to describe any type of activity that activates proprioceptive receptors. Proprioception is the sensory system responsible for body awareness and it activates in the muscles, joints, and ligaments. 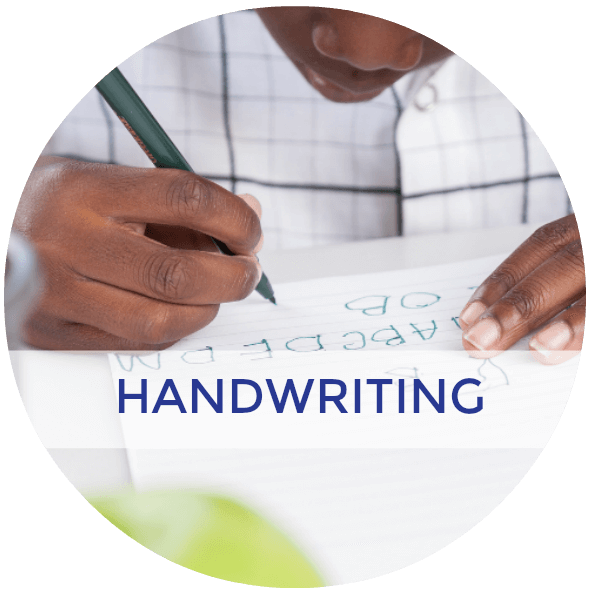 Heavy work can have a calming effect or alert and orienting effect based on what your child is craving. It allows your child to get adequate proprioceptive input that will help them focus and increases self-regulation. 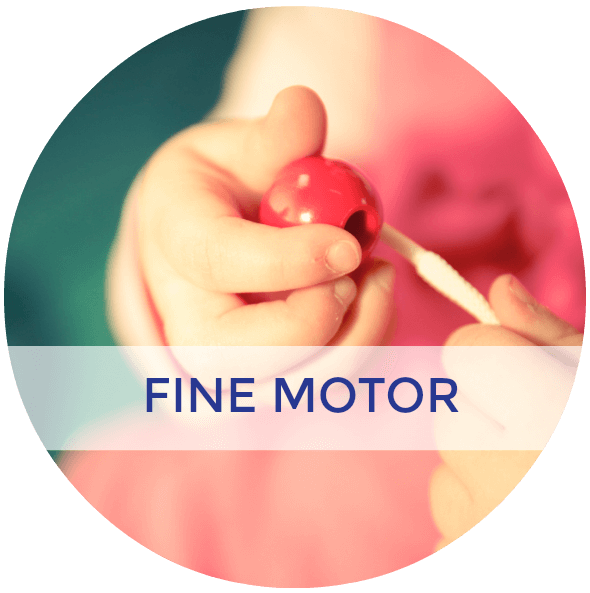 Proprioception works closely with the vestibular system which has a huge effect on your child's behaviors. 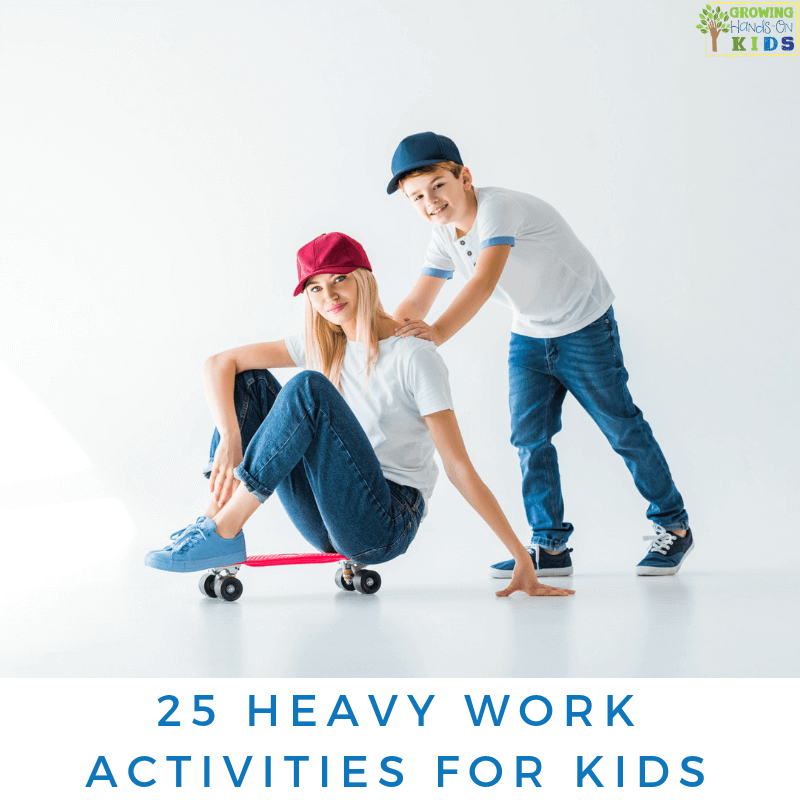 Heavy work activities make great “brain breaks” during the school day or when your child just needs some time to reset so they can focus on an activity or task. This is a huge list, so just pick the activities that fit your space or what you think your child would be interested in. Based on this list, can you come up with your own heavy work activity? I'd love to hear your suggestions in the comments below. Make sure the laundry basket is heavy enough that actually requires some work for your child to push it, but not too heavy that they struggle to push it. You can make it into a race or obstacle course. Some items you could fill it with are books, stuffed animals (this works great for younger kids), or any other random items from around your house or classroom. 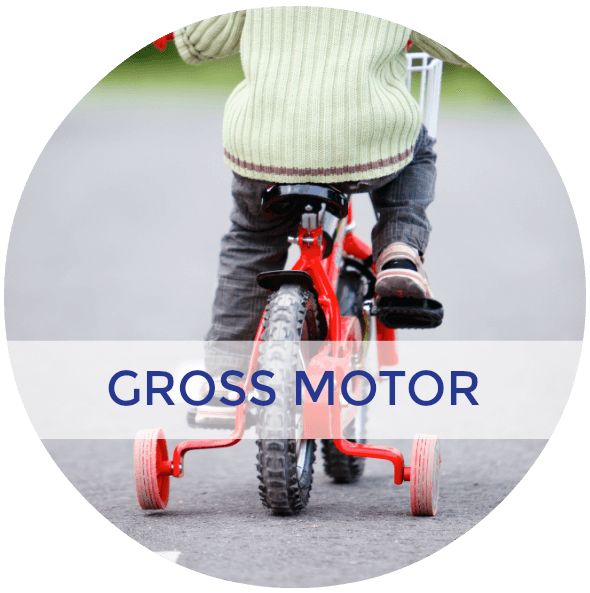 Children who crave proprioceptive input can often be found “crashing” into things. Whether rubbing on the walls down the hallway at school or literally jumping off furniture or beds. Providing some controlled crashing experiences will help give them the input they are craving in a safe way. Bean bags, piling up blankets and pillows, or making a huge ball pit out of a small swimming pool can work. These can be great to have around during homework or during class time to give some added input to help focus and attend. They are easy to make with rice or beans. 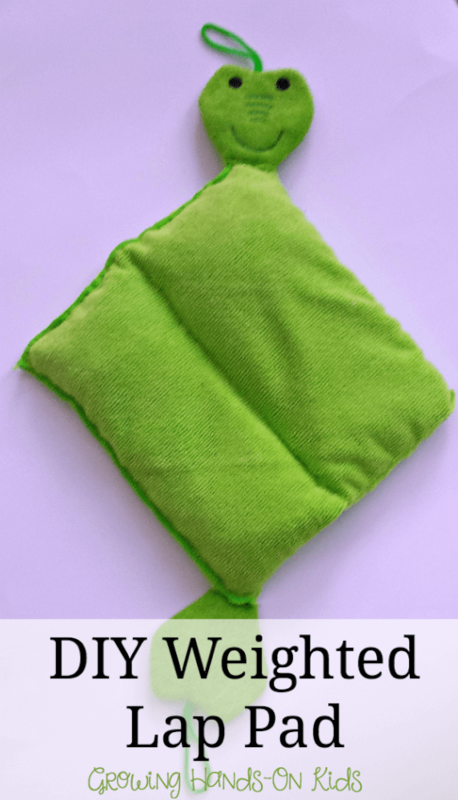 You can find a DIY Weighted Lap Pad tutorial HERE. 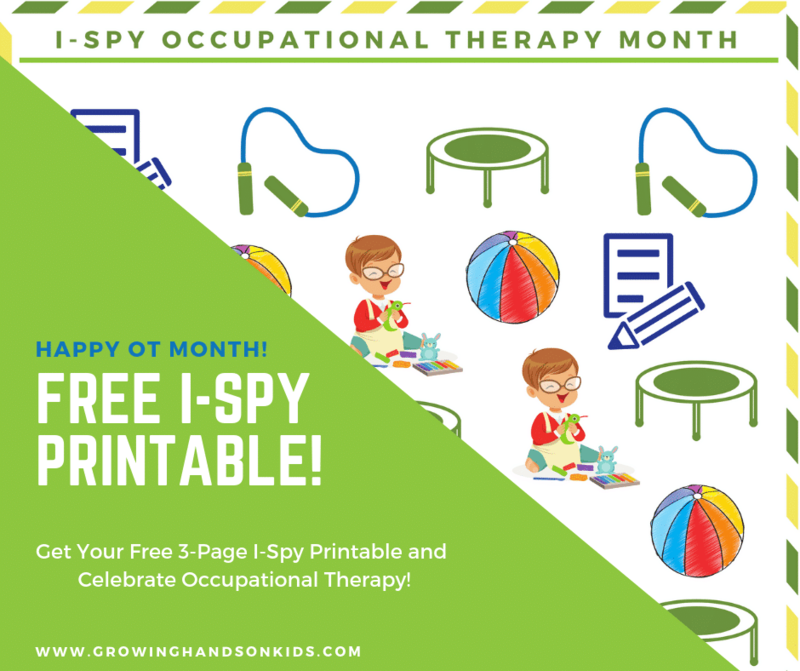 This is a fun activity that you might see in Physical Therapy or Occupational Therapy sessions. Think of them as two mini trampolines attached to your feet. 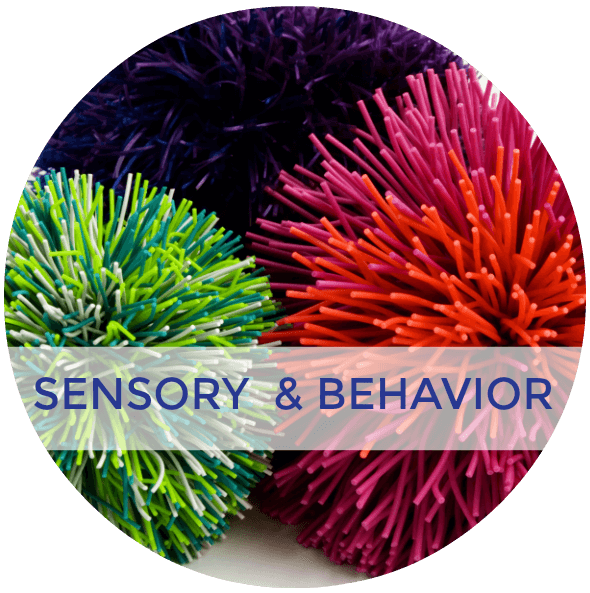 They are a little on the pricer side as far as equipment goes, but they would make a great additional sensory room activity at school or outside at home. Bean bag chairs are great to have as alternative seating options or in a quiet or calming space. It can be like getting a nice hug but without the actual hug. This can have a calming effect and also help kids focus while reading or doing other calming activities. 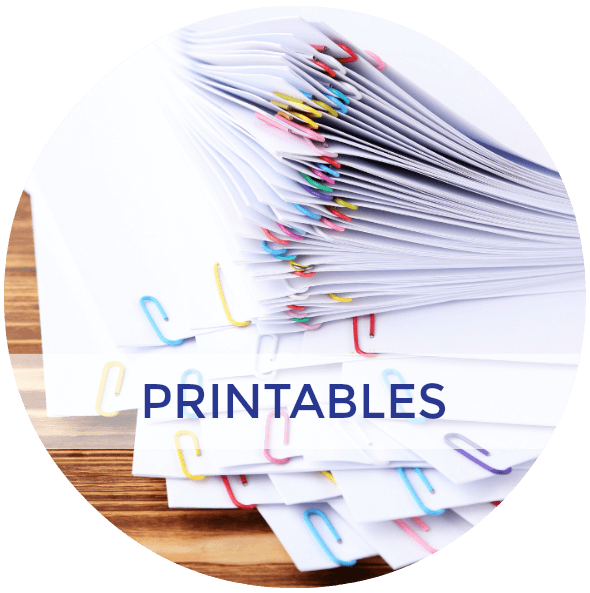 This can be used in the classroom or at home with an office chair. They can push a friend, a sibling, or you. Body socks are great at giving input for where your body is in space. Plus the child can push against them and get the needed proprioceptive input they need during a time when they need to be sitting in a group. You can also use this at any time, not just circle time. You can get different sizes depending on the ages you are working with. Typically small, medium or large sizes are available. You can also read my post on activities to do with a body sock HERE. You can get regular lycra material and tie it around a chair or desk to make a little pocket. A child can push their feet against it or hands under a desk to get some added input to help them focus during desk work. 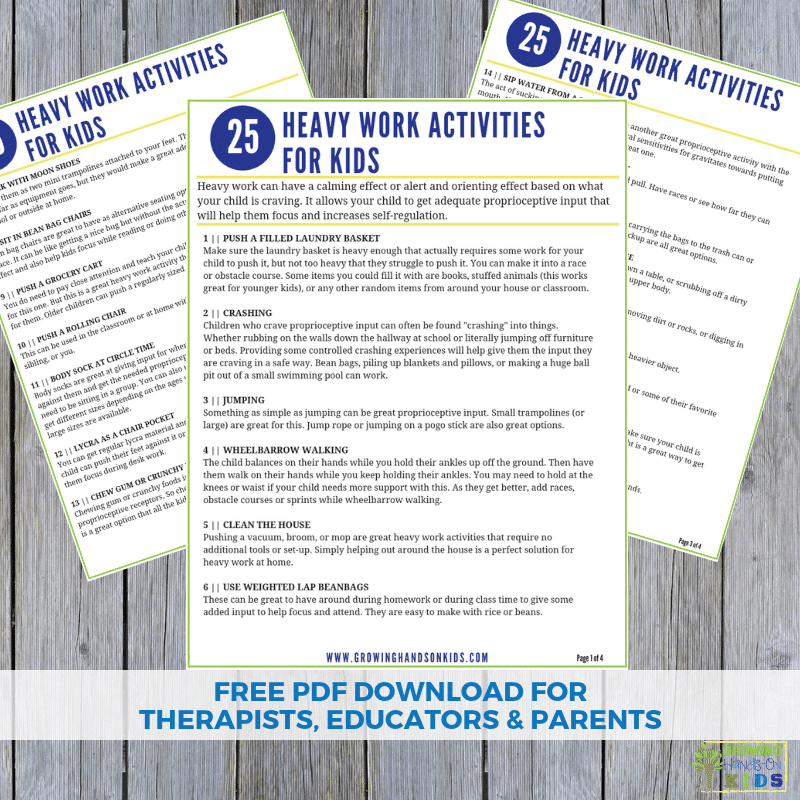 I created a 4-page heavy work activity PDF printable download for you. 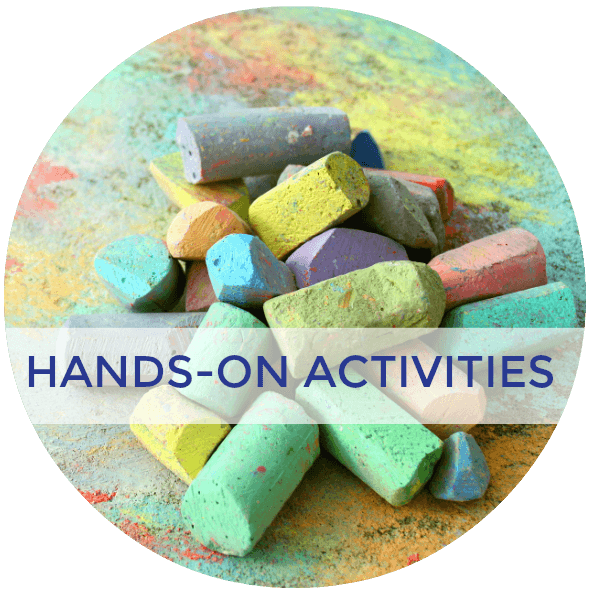 You'll get all 26 of this activity suggestions with the descriptions below each. It's completely free, just enter your email address in the form below. 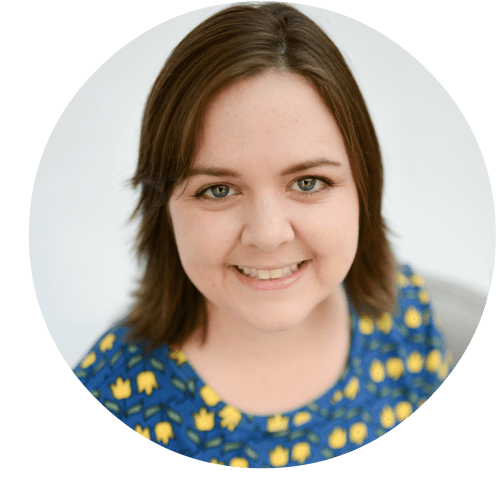 You will also receive some follow up emails on each of the 8 sensory systems that give you detailed red-flags and activity suggestions for each. 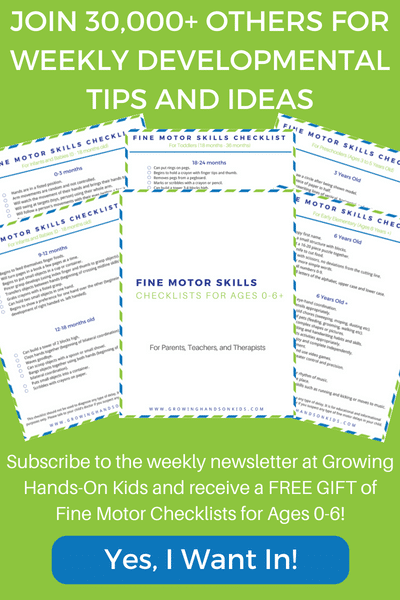 And you'll also get weekly child development tips, tools, and strategies in my weekly newsletter. Need more ideas? Check out the resources below.